Complex carbohydrates are made up of sugar molecules that are strung together in long, complex chains. Complex carbohydrates are found in foods such as peas, beans, whole grains, and vegetables. Both simple and complex carbohydrates are turned to glucose (blood sugar) in the body and are used as energy. Glucose is used in the cells of the body and in the brain. Any unused glucose is stored in the liver and muscles as glycogen for use later. 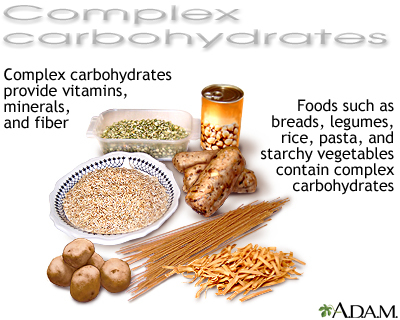 Complex carbohydrate foods provide vitamins, minerals, and fiber that are important to the health of an individual. The majority of carbohydrates should come from complex carbohydrates (starches) and naturally occurring sugars, rather than processed or refined sugars, which do not have the vitamins, minerals, and fiber found in complex carbohydrates. Refined sugars are often called "empty calories" because they have little to no nutritional value.